New Romic Boxxer upper crown! Just got word from Darren Murphy at Romic that their new Boxxer crowns just have been sent out to get anodized and should be ready sometime before Big Bear nationals. Imagine... A Professional Mountain Bike Team helping you become a biking god! Giant, North American pro riding Team Tara Llanes, Dustin Adams and Jarde Rando, with the help of Chuck Brennan from kamloopsbikecamp.com, will help shape you to be that rider you only dreamed of. This mind-blowing showcase will be held at Calgary Olympic Park July 29th. 30th. & 31stand at Sun Peaks August 5th. 6th. & 7th. 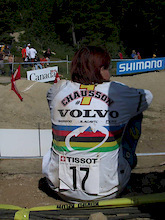 Here is one rumor that has been drifting around for a while: Anne-Caroline Chausson has retired from racing. The truth: not quite, but we won't see nearly as much of the fabulous Frenchwoman as in years past. In a recent exclusive interview with Chausson, the former Volvo-Cannondale star told us that she is planning on splitting time between "free ride events and World Cups." Chausson added that she may show up for round 2 of the downhill/four-cross World Cup at Alpe d'Huez in France, but otherwise it will be "alternative" type events only until August's world championships in Switzerland. Chausson added that she'll likely hit the World Cup finals, which come a week after world's at Kaprun, Austria. 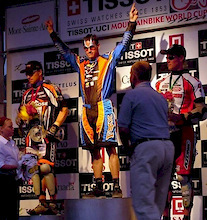 southerndownhill.com to bring you live Fort William WC updates. We thought we'd take a minute to explain what we are planning to do over the weekend of the UCI World Cup triple-header (DH, 4X and XC) taking place in Fort William from the 31st May to the 1st June 2003. Warwick Patterson and Ted Tempany have been busy working on their new movie project called RISE. What will RISE be all about? Fracture Products shows tonight in Abbotsford. Pedal Sport and Jack's Cycle in Chilliwack, Cheyenne Sports in Hope, or at the door. Exclusive Marzocchi prototype fork pictures. As my usual self, I was browsing the many informative bike sites this morning and landed on pictures of this new Marzocchi prototype fork. These exclusive pictures are brought to you by the guys at southerndownhill.com. So mad props to them for giving us a sneak peek! See the "888" Pics here.. The ultimate weeklong camp for riders aged 13 to adult. 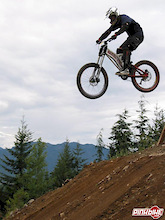 Under the direction of Canadian Downhill Team member and X-Game Gold Medallist Andrew Shandro, riders will be inspired to take their bikes and their bodies to new limits within the terrain of the Whistler Mountain Bike Park. Day of May 17th. Seven day per week operations will commence at this time. Yet more interesting news from stiksandstones.com! There where many rumors running around about Brian breaking his wrist, some were saying it was his hand, etc..
Missy Giove to leave full time bike racing. I was just reading on Stikman's site that Missy "The Missile" Giove will be leaving full time pro bike racing and that some big announcements will be released in a few days. Stik says Missy will still race a "few" events, but is moving to New Mexico to pursue other interests. Here is what Missy had to say: "Anne Caro is also retired from full time WC racing as is Leigh...which leaves me not as enticed to race the WC Tour!" More on this news by weeks end..soo keep an eye on stiksandstones.com for all the latest and greatest industry tidbits! A few tips from professional Kona rider John Cowan can transform a rider's bunny hops into big air stunts girls love. At least that's the sales pitch of Cowan's Higher Learning DVD, which teaches the basics of dirt jumping. elite's whilst Dave will be mixing it up in the new expert category. Matt Hunter Wins the Second Annual UFC! proud to announce that Matt Hunter has won the second annual Ultimate Freeride Challenge. Of course, you'll have to watch Statement to see the entire sequence, but until it arrives in your local bike shop or you order it online, here is a little preview. Well it has been a long road to completion, but here we are. First I would like to the team of people that helped put this little project together. I think I better thank my wife Kim for giving birth to our son Kaeden (you should see his hammer!! ), so I now have a whole new realm of toys to play with and purchase. The Bjorn Enga produced, two-year-in-the-making masterpiece featuring Tyler Klassen, Darren Berrecloth and Thomas Vanderham rocked out in Calgary last night, so be sure not to miss out. Yeah, I know we ran low on bandwidth to put up all the DropIn TV episodes....BUT....this episodes just rocks! So here it is for all you that have not picked up the Dropin DVD set yet. Episode 8 - Kamloops is currently online and available for download. Kranked 5 premiere in Calgary - Tonight! That's right, Kranked 5 playing at Calgary's own Globe Cinema tonight, Monday, April 14. Showtimes are 7 and 8:15 and as usual there'll be a ton'o swag to be given away. Over 2 years in the making, I have a feeling this will be the bike film of the year. Featuring some of the industry's best riders including Tyler Klassen, Darren Berrecloth and Thomas Vanderham and choreographed by none other than Bjorn Enga, this is definitely one movie you don't want to miss on the big screen. Tickets are only available at the door and admission is $10 for adults and $8 for 17 and under. Visit the Radical-Films web site for the teaser and a full listing of their North American Tour dates. The Globe Cinema is located downtown at 617 8th ave, SW., across the street from Cowboys. Imagine a bicycle suspension that could allow you to pedal over roots and rocks efficiently, without sacrificing traction and handling. Imagine a system that allows you to pedal as hard as you can, while resisting pedaling induced movement. Imagine a system that lets you pedal with incredible efficiency, without reverting your bike into a hardtail. The dw-link suspension system is a patent pending leap forward in suspension technology that accomplishes all of this. Coming down off the badlands of Drumheller on a mountain bike, a single rider travels off the unsettling terrain of the hoodoos. For a moment to those watching, the rider appears to hang in the air before smoothly executing a landing. But to the one on the bike, that exhilarating moment lasts just a few seconds longer. 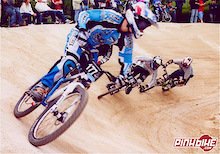 Haro Bicycles Signs Freerider Kyle Strait and 2002 Junior Downhill National Champion Cody Warren for 2003 season. In an announcement more shocking than Michael Jackson's interest in women, Santa Cruz Bicycles announced today that they will give away 450 Blurs at the 2003 Sea Otter. It's finally official: The UK's top woman DH rider, Fionn Griffiths, will be contesting both NORBA and UCI World Cup events in North America with the Foes/Azonic team. It looks like quite a few local sponsors have stepped up the ante for the show by donating lots of prizes. Sponsors for the night include most Calgary shops, Bushido Tattoo, and Cadence Coffee house. Just in case you missed it the first time around, here's a re-itteration of all the details. 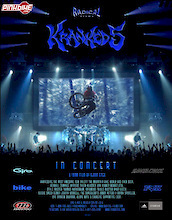 That's right, Kranked 5 playing at Calgary's own Globe Cinema on Monday, April 14. Showtimes are 7 and 8:15 and as usual there'll be a ton'o swag to be given away. Over 2 years in the making, I have a feeling this will be the bike film of the year. Featuring some of the industry's best riders including Tyler Klassen, Darren Berrecloth and Thomas Vanderham and choreographed by none other than Bjorn Enga, this is definitely one movie you don't want to miss on the big screen. Tickets are only available at the door and admission is $10 for adults and $8 for 17 and under. Visit the Radical-Films web site for the teaser and a full listing of their North American Tour dates. DropIn is proud to announce the Dropin Crew store. Dropin and all the season sponsors will bring you limited products to the Online Crew store so all you rippin riders can pick up at wicket deals the same gear the DropIn riders are wearing and riding. This is an exclusive from the sponsors of DropIn. Check out our first addition - Idun clothes. All proceeds go back into the show. Gracia wins Moab's Tour of Canyonlands race. sent over a set of their Road Gap flat pedals for us to check out. Best Spring Party in the Kootenay’s - This Weekend!! "Chinese downhill, what the #@%& is a Chinese downhill?" Still one of my favourite movie quotes of all time. For those of you too young to have seen Hot Dog - The Movie, find a copy on kazaa, it's worth the bandwidth. Kimberley Ski Resort is wrapping things up this weekend with a FREE Chinese Downhill. That is, mass start - anything goes - first one down takes the booty! I was just reading on VeloNews.com that the Union Cycliste Internationale, on Friday, will now make helmet use compulsory for professional cyclists! About time!! We told you it was going to be close. We said that every vote was going to count. But even we couldn’t have predicted how tight a race it would be for the finals. With the hours closing in on the voting deadline, riders were separated by only a handful of votes! The boys at Downfall Productions have put together this nifty Aaron Chase promotional video for the Evil Bikes STS chainguides. Check it out!! Right click and 'Save As' to your hard drive. . . Enjoy! 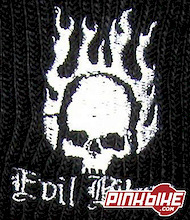 Also, don't forget to regularly check out the Evil Bikes and e13 Components web sites for current updates. The Sea Otter Classic will kick off its week of events with a "champions gala" at Fox Theatre, Redwood City at 7 p.m. on Tuesday (4/ evening. place at the Centennial Theatre in North Vancouver on April 6th at 7pm. copies of Mountain Bike Action magazine. See you all there. 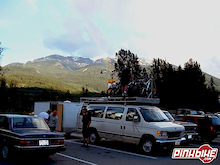 Transporting your rig is something many of us suffer with because the systems out there generally seem pretty imperfectly designed for bigger bikes or quick access. The traditional rooftop rack forces you to take off your front wheel and mount to a bracket using quick release skewers - not a quick process and often doesn't fit disk brakes well. And that's only for a bike with a standard quick release axle. Many of us at pinkbike are riding bikes with 20mm through axles and/or upside down forks, where the mounting process involves struggling with spinning fork legs, flimsy adapters, and mounts insufficient for 45 pound bikes. Any of you without trucks surely know what I'm talking about. Beyond the Valleycliffe of the Dolls! Nestled between Vancouver's famous North Shore and the all mighty Whi$tler Mountain lies a town of quiet heroes and future legends. The event: Beyond the Valleycliffe of the Dolls! The Date: Saturday, May 31, 2003 11:00 SHARP! 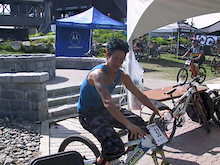 Reported here months ago, but now official, the Whistler Summer Gravity Festival will feature the Tim Horton's Mountain Bike Nationals in addition to a bevy of other high profile events from July 14 - 20. I have it on good authority this event is being put together by Henry Pejril (Kamloops Nationals), Richard Juryn (Shore Events), Paddy Kaye and the Joyride Crew, all leaders in event planning. Reading through their press release is like looking through a full season's worth of events. Let's see, the Nationals, Air DH, Joyride, Slopestyle Expression Session, World's biggest loonie race, Village Fat Tire Criterium, Trials Competition and more all crammed into one week's worth of fun and frivolity! all cyclists looking forward to this event coming up on April 19-21, 2003.
to be a great weekend of cycling in BC. See you at the races! Interbike's OutDoor Demo will be two days this year and will be held in Boulder City, Nevada. OutDoor Demo simply outgrew Black Diamond, Nevada, where it had been held, and the single day format, said Lance Camisasca, Interbike's show director. DropIn - the bus is full! Calgary, April 2, 2003 -- Drop In Crew 2003 Selected. 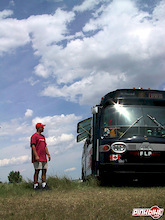 Yes, it’s true, after careful consideration the bus is full! The riders are stoked and can’t wait to get on the road. The locations will be revealed as the tour is in progress through live updates, teasers, and the forum which we will be keeping in constant touch through-out the tour. Stay tuned for a release of guest riders that will blow your minds! 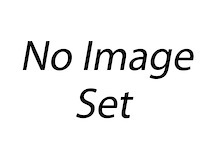 This contains information on park entry procedures and other important information about timing, scoring, results and protest procedures. fire to burn brighter than ever before! Steve Peat just took delivery of his new 2003 Team Van! Big thanks to Jon_e Beckett from Descent-World.co.uk for providing the pic. 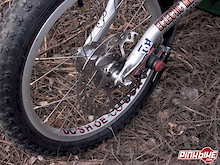 Brian Lopes 2003 GT bikes!